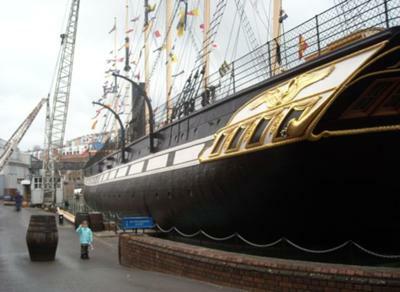 This is my daughter Jem and the SS Great Britain, Bristol. We had a great day out - she said it was her best day ever (although, to put this in perspective, she said the same thing last week when we went to a farmers' market). What I loved about the SS GB experience, was how it just kept getting better and better. I expected that we would be able to look at the ship, but that was about all. I was suprised to discover that it is in a dry dock and you can walk around it. Then I found the museum - that was great. Next I found you can go onto the deck of the ship itself. Finally, I was astonished to discover that you can go below decks, and the whole ship has been refurbished so it looks like it was in Victorian times. There are cabins, an engine room, steerage, kitchens, a dining room... It really feels like stepping back in time. Jem and her brother chased each other round the ship, spun the wheel, climbed on the bell (not sure they were meant to do that actually), asked loads of questions, and got a bit scared by the dummy of Isambard Kingdom Brunel. Best day ever? Not far off.